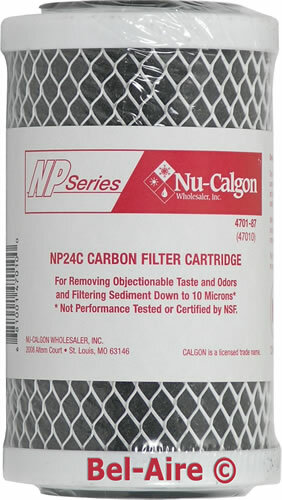 NuCalgon NP24C carbon block cartridge manufactured from high-performance activated carbon that simultaneously removes chlorine, hydrogen sulfide, and other organic chemicals that contribute to taste and odor problems. Provides particulate removal and dirt holding capacity down to 10 microns. Radial flow (outside-to-inside), results in a higher flow rate at a comparably lower pressure drop. The NP24C is designed to handle up to 200 gallons of water per day for six months. Made with FDA-approved materials and can remove VOC and TOC. Model NP24C, Part Number 4701-87.